We’re excited to announce that we’ve partnered with The Conrad Hotel at 101 East Erie Street to offer the Bacon Me Crazy accommodation package. 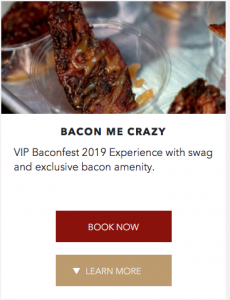 Available on the nights of April 5 and 6, this package includes a pair of VIP tickets to the Baconfest session of your choice, a certificate for two items of Baconfest swag from the fest merch booth, accommodations the convenient and luxurious Conrad Hotel as well as an exclusive in-room snack of Baptiste and Bottle’s Bacon Mac n Cheese. If you’re coming in from out of town and wondering where to stay, wonder no more! The Conrad is a superb hotel located just a 10 minute ride from Baconfest via Uber or Lyft. Packages can be booked from the Conrad’s Special Offers page – scroll down to the Bacon Me Crazy package and click Book Now to choose dates and room types.